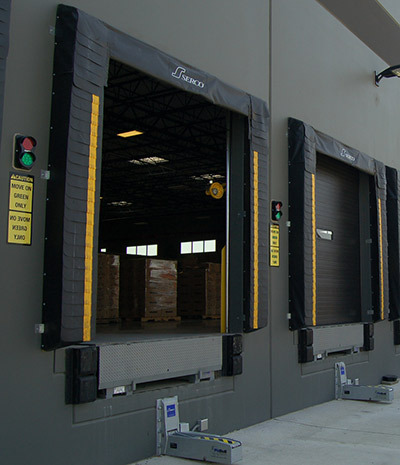 McKee’s Dock Seals and Shelters are designed to improve safety, protect merchandise, reduce cost (via energy conservation), and improve security at the loading dock. McKee offers a wide range of fabric materials, configurations, and options allowing you to build the best solution for your application. Contact us today to create the best possible solution for your application! 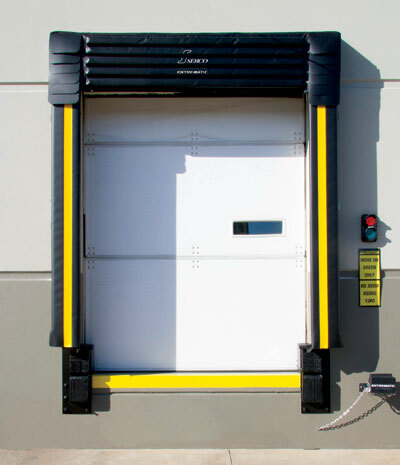 Ideal for smaller doors (9’ wide x 9’ high or less), the Serco S-600 Series foam dock seal with head pad model automatically seals as a trailer is backed up against the foam pads, providing a positive seal between internal and exterior environments. Its heavy-duty construction includes roll-formed SercoSteel® galvanized steel, for quality durability that lasts with minimal maintenance. 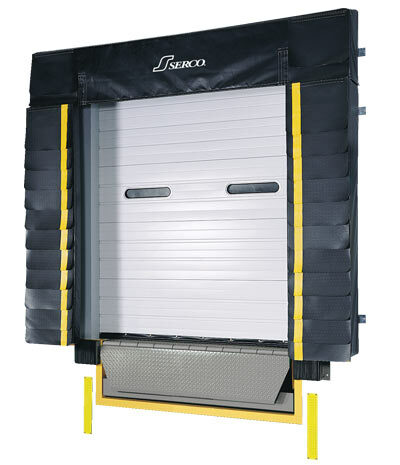 The Serco S-700 Series foam dock seal with head curtain is able to accommodate a variety of vehicle heights, and is ideal for industrial doors 9 feet high or taller. A hood-style head curtain seals the rear of the vehicle, while end caps secure the drop curtain to the side pads. Durable fiberglass stays provide stiffness in the top of the curtain for better moisture drainage, while rugged, roll-formed galvanized steel framing increases durability. Seamless aluminum tubing provides the head curtain with additional support. 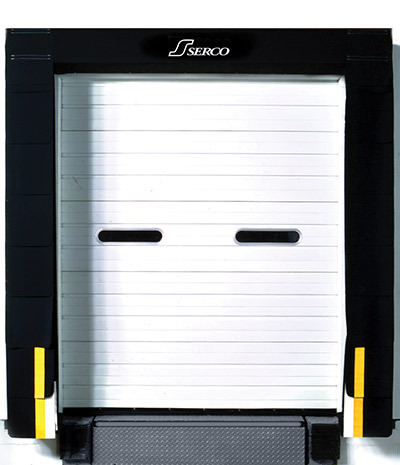 The Serco S-800 Series foam dock seal with adjustable head pad provides a sturdy seal for a full range of trailer heights, with a manually adjustable head pad that allows you to position it on a 48-inch vertical track. A standard 18-inch high foam head pad is mounted on a heavy-gauge steel pad. 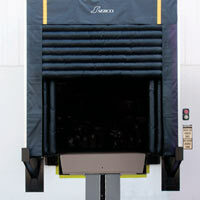 The Serco Ironside™ model IDS-HP Dock Seal combats challenges at the loading dock such as more abrasive movements from air ride suspensions and intermodal trailers, sharp edges on trailers where they interface with the dock seal, and yard spotters creating a prying motion on the seal head pad – all while also providing superior environmental control. Ironside™ is made with Serco-exclusive UHWR™ (Ultra High Wear Resistant) fabric, which has been tested and certified to 40,000+ abrasion cycles – up to 10 times the abrasion resistance of the competitive fabrics tested – for superior wear resistance. 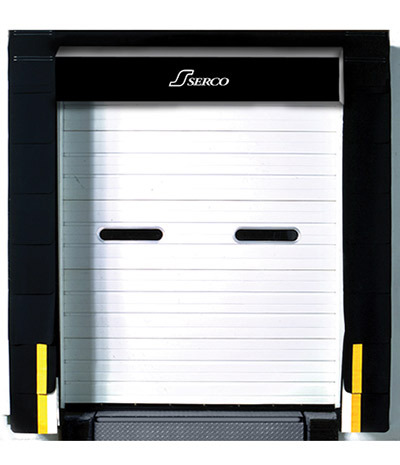 The extremely versatile Serco S-3000L Series L-shaped side pad foam dock seal with head pad provides full-width access to a trailer when docked at doors up to 9 feet high. Its premium features include a compression foam head pad with L-shaped side pads, which are equipped with triangular-shaped foam wedges to offer added support, along with roll-formed galvanized steel framing. 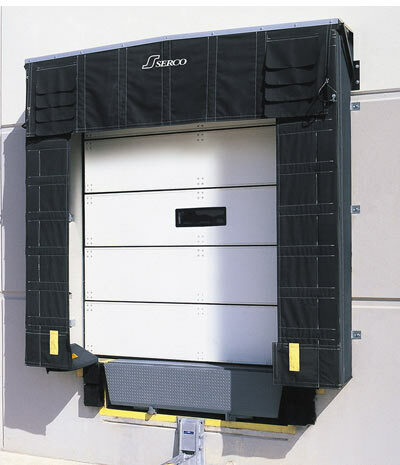 The Serco S-3000HL Series L-shaped side pad foam dock seal with head curtain features a modular hood-style head curtain that’s able to accommodate a variety of trailer widths and provides total access to the vehicle when docked at doors with openings over 9 feet high. It won’t over-compress due to extra projection required on similar competitive models. 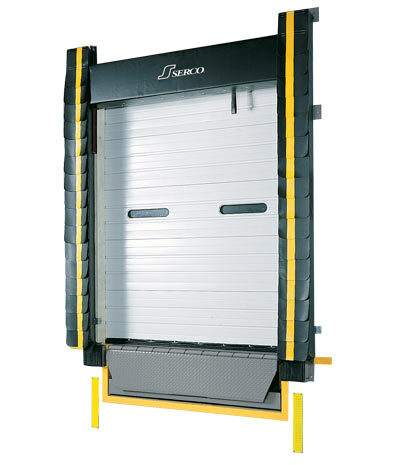 It also includes the rugged, roll-formed galvanized steel framing that’s a Serco dock seal standard. Get superior sealing effectiveness even if your trailer is docked off-center with the Serco S-1000 Series ULTRA-SEAL foam dock seal with head pad. This unique seal accommodates a wide variety of trailer widths up to 8 ft. 6 in. 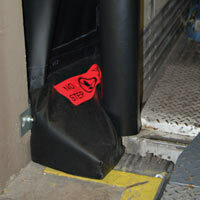 The head pad seals along the top edge of the trailer, while side pads seal the hinge gap on trailers without blocking the doorway for better access to the back of the trailer. 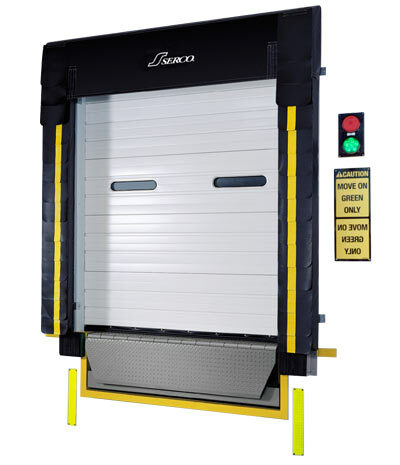 The S-2000 Series ULTRA-SEAL foam dock seal with head curtain features a tight sidewall seal, with the additional benefit of a hood-style head curtain for application with taller doorways. The modular hood design includes extra durable XL-100 Super Fabric curtain, support pads on seamless aluminum tubing for front support, end caps and galvanized steel framing for even greater strength and protection. Looking for the strongest Serco dock seal? 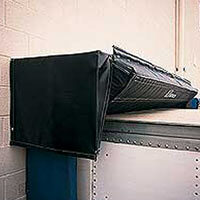 Get it with the S-2500G Series GUARDIAN® foam dock seal with two-piece movable head pad system. This dock seal actually moves vertically with the trailer, in turn reducing wear on the side pads and head pad and increasing the life of your dock seal. 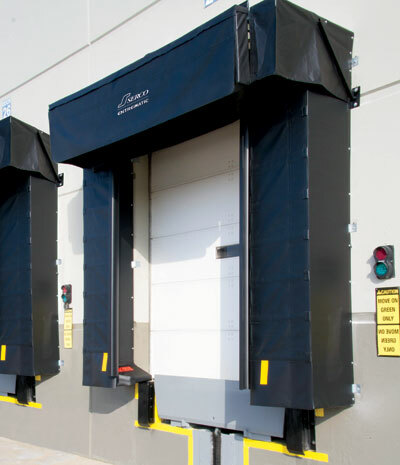 The gravity-biased, flexible frame of the Serco S-3200 Series SnapBack dock shelter yields for misguided vehicles, preventing costly building and shelter damage. Here’s how it works: as a misguided vehicle approaches, the frame moves upward and back to prevent impact. Once the vehicle leaves, the frame returns to its original position. This smart design accommodates a variety of vehicles sizes and types, while providing full trailer access during the loading process. 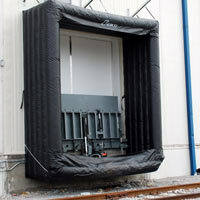 The Serco Blackout™ model BDS-S Dock Shelter is specifically designed for the most demanding applications. 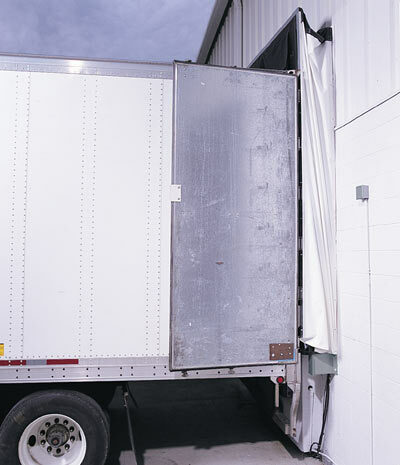 It stands up to the test of air ride suspension and intermodal trailers creating more abrasive movements on the dock shelter, while also helping maintain consistent temperature control, avoiding energy loss, effectively sealing varying trailer configurations and meeting regulatory requirements. Blackout™ features the exclusive Serco UHWR™ (Ultra High Wear Resistant) fabric for superior wear resistance. UHWR™ has been tested and certified to 40,000+ abrasion cycles – up to 10 times the abrasion resistance of the competitive fabrics tested. 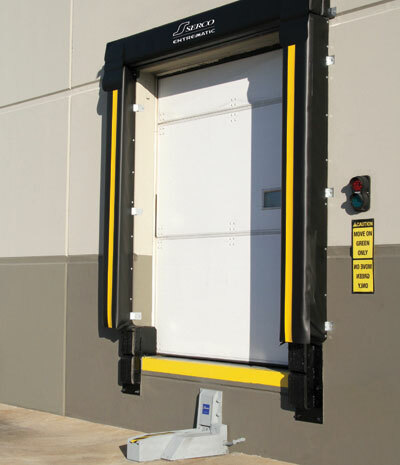 Improve dock safety, energy efficiency and loading dock environmental control all at once with Serco inflatable dock seals and shelters. 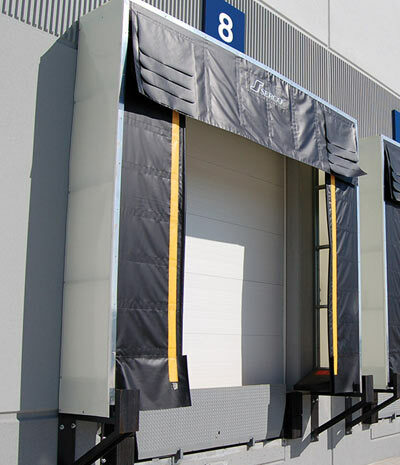 Ideal for climate-controlled loading docks, inflatable dock seals and shelters offer flexibility and convenience, as they create the ultimate energy seal for your dock without putting pressure on your building walls. And best of all, they can easily be interlocked with Serco restraints and other dock equipment for improved efficiency and safety. 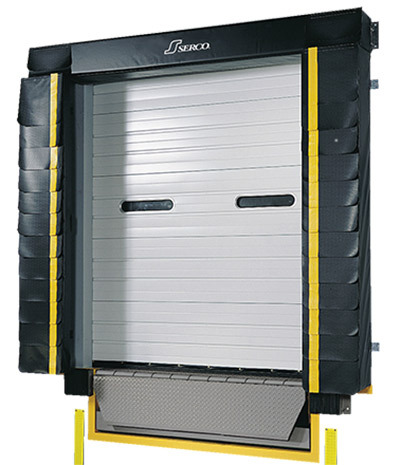 Serco rail shelters offer the perfect link between railway cars and your loading dock, for a seamless transition that keeps products and goods protected from outside elements. Rail shelters are suspended on a steel frame and come equipped with steel extension arms, which allow them to cover the gaps between docks and rail cars. 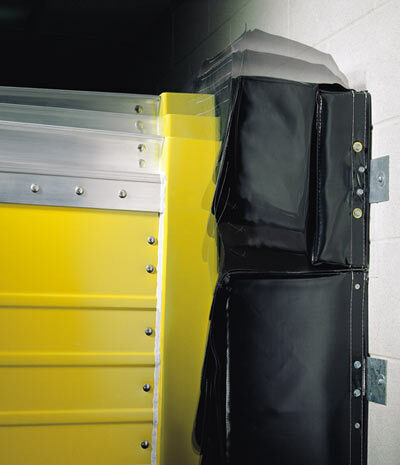 Keep products safe from costly water damage with a rain sealing system like the Serco S-900DD Series DryDock®. This rain sealing system features an ingenious “wiper” pad that keeps external moisture out of the loading area by scraping water off the top of trailers while they back into position at the dock door. Its simple design requires virtually no maintenance.